This website is maintained by the Artistic Estate of Elaine Summers / Kinetic Awareness® Center, Inc.
with special thanks to Jerome Robbins Dance Division, the New York Public Library for the Performing Arts. Thanks to longtime consultant Jenneth Webster, who is missed dearly, every day. This presentation of work by Elaine Summers has been conducted in proper consultation with, and the approval of the Artistic Estate of Elaine Summers with thanks to Kinetic Awareness® Center, Inc. Special thanks to the Jerome Robbins Dance Division, The New York Public Library for the Performing Arts. Special thanks to Pearl Bowser who generously brought her knowledge and memories of working with Elaine into the preservation process with Trisha Brown Dance Company. They in turn are excelling under Project Archivist Ben Houtman with care and diligence. The preservation has been done with a grant from the Mellon Foundation under the technical direction of Bill Brand, and with facilitation of the Artistic Estate of Elaine Summers by Kinetic Awareness® Center, Inc. Here is once again the interview where Pearl explains how she was working on an edit of her own from the above material, which is now at the Smithsonian National Museum of African American History & Culture. She created this edit as Associate Artist at the Elaine Summers Experimental Intermedia Foundation. The music in the film is by Elaine's longtime friend and collaborating composer Carman Moore! Thanks to Vincent Mineo, Harriet Bograd, Carman Moore, and everyone at Kinetic Awareness® Center, Inc. for making it possible! of which Elaine and her work will be an integral part! October 2017 is bursting with activity! Elaine Summers' filmdance Two Girls Downtown Iowa will be screened at POOL 17/Dock11, Berlin Germany on October 4th, 2017, 19.00h, attended by Thomas Körtvélyessy as artistic exector of the Estate. Many thanks to Yoshiko Chuma and the festival organisers for their kind invitation and support, as well as Davidson Gigliotti, Cathy Weis, Jean-Ulrick Désert and Kinetic Arts & Sciences / Kinetic Awareness® Center. Special thanks to the Jerome Robbins Dance Division, The New York Public Library for the Performing Arts. Come and enjoy kinesthetic delight and wonderful surprises! To close: the Kinetic Awareness® Center / Kinetic Arts & Sciences, Inc. has launched a new project to celebrate Elaine's living legacy, coordinated by Michelle Berne and Leeny Sack. A first round of submissions will be accepted until Elaine's upcoming birthday February 20th, 2018. Please download the call for submissions for further information. Pauline Oliveros 1932-2016, composer, founder of Deep Listening and longtime friend and collaborator of Elaine's. Pauline has created unforgettable music for dozens of improvisations and performances. It was her music piece Crow's Nest which inspired Elaine for her intermedia-piece combining film and dance of the same name. Pauline also contribute as musical co-director and composer for many of Elaine's later performances, including Hidden Forest and Skytime as well as Elaine's Memorial. Hans Breder 1935-2017, intermedia artist and professor at Iowa University. Hans was a longtime friend and collaborator of Elaine's. He invited her many times as artist-in-residence at Iowa University, where she would then create works such as Two Girls Downtown Iowa, Iowa Blizzard '73, and show first versions Skydance as part of the 2nd Experimental Intermedia Festival. Together they helped create the understanding of intermedia as an art-form in itself, going beyond mainstream categories. The Estate of Elaine Summers and the Board of Directors at Kinetic Awareness® Center, Inc.
where the Archive of Elaine Summers is being taken care of. Made possible through the collaboration of Elaine Summers Dance & Film Co. with Judson Memorial Church, Movement Research, Kinetic Awareness Center, and through a generous grant by the Court Iron Cast Corporation, SoHo (chairman: Davidson Gigliotti), with the tireless contribution of all who are donating their time and energy for the love of Elaine's Memorial. Thank you! With deep sadness, Elaine Summers Dance & Film & Web Co. announces the passing of Ms Elaine Summers on December 27th, 2014, 5.30 am at Bellevue Hospital, New York City from the consequences of a fall that she suffered at her home a few days before. Our heartfelt condolences go out to Elaine's family, friends, students, and lovers of her visionary and pioneering work. Elaine's vision and understanding of movement, which reached beyond many opinions of her time into the present and the future, her wonderful energy, her deep wisdom, her ability to work with the most minute of ways, her laughter and encouragement to all who have worked with her, will all be dearly missed. Click here for what became her last performance, Skytime / Moon Rainbow at Solar 1, New York, 2014. - and Dance Magazine by the amazing Wendy Perron. May her legacy continue to spread and create beautiful moments for all who encounter it! Photos by Paula Court, Copyright 2012. WOW, what a week! We have some beautiful photos to share with you of Douglas Dunn and Jon Gibson (flute) performing with Matt Turney (on film) in Elaine's Windows in the Kitchen at the American Dance Guild Annual Performance Festival where Elaine was honored for her life's work. We presented Windows September 6th and 7th 2012, at the Alvin Ailey Theatre, NYC. On the Friday night, we also invited our friends on stage for Invitation to Secret Dancers. More photos coming soon! New York Times review by BRIAN SEIBERT, Published: September 7, 2012. Dance Magazine blog post by Wendy Perron. We've been busy celebrating the 50th anniversary of the First Concert of Dance at Judson Church in 1962. Elaine sat down with Samara Davis from Artforum to share her experiences about Judson. Here's the interview as part of Artforum's 500 words segment. Elaine had a wonderful conversation with the lovely Lana Wilson, for Danspace's PLATFORM 2012: Judson Now, September 7, 2012. Movement Research, Danspsace Project and Anthology Film Archives will be presenting a special film screening "Judson Reconstructed" on Sun, October 7th at 3pm. This video is from our reconstruction of Ouverture, presented as part of Movement Research's celebration of the anniversary. July 6, 2012, at the Judson Church. 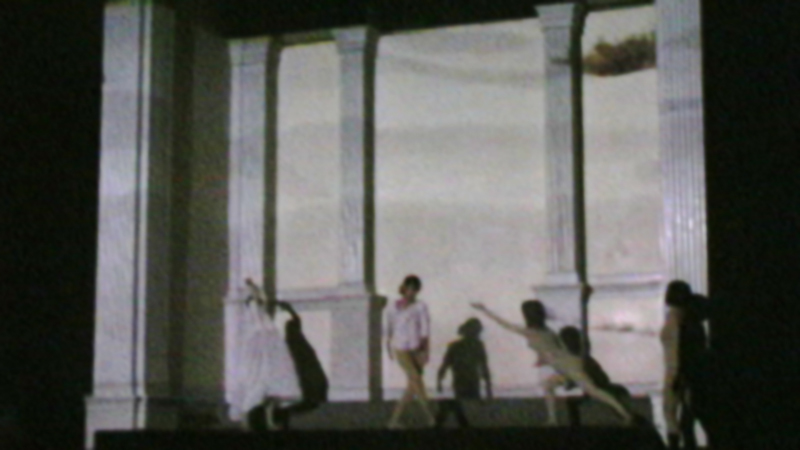 OUVERTURE (SPLIT SCREEN & BY CHANCE DANCE & FILM) was originally performed in 1962 with fifteen minutes 16mm film & 1 dancer, realized for Judson Dance Theater's First Concert. The audience is requested to walk through the movie screen before seating. In the film: Deborah Hay, Freddy Herko, Richard Brodney, Kenward Elmslie, Carol Summers, Elaine Summers, Sally Gross, Ruth Emerson, Carla Blanc, Arthur Levin, Al Carmines, George McGrath, Steve Paxton, Remy Charlip, Lila Pais, Josh Pais, John Worden, Sally Stackhouse, Harold Johnson, Joseph Schlichter, James Waring, Arlene Rothlein, Edward Barton, Rev. Howard Moody, Carolee Schneemann, Clyde, Rosie & Michael Lax, Christine Myers, Sandra Neals, Phoebe Neville, Larry Seigal, Robert Rainieri, Al Hansen, Ira Matteson, Bill Meyers, Johanna Vanderbeek, Carolyn Chrisman, Robert Ranieri, Norma Marder, Lou Rogers, John Patton, John Hoppe, Kyle Summers, Malcolm Goldstein, John Herbert McDowell, the parade for the astronauts on their return from the moon. "McD: There's an interesting description by John McDowell of the opening of the first concert: 'The very first dance that ever happened at Judson was really very extraordinary in a couple of ways. First, the beginning of it, which was Bob Dunn's doing and was beautiful. The dance concert was announced to start at 8:15 and they went upstairs into the sanctuary to find that in order to get to their seats they had to walk across a movie that was going on. This movie consisted of some chance edited footage by Elaine Summers and test footage that I made... And we went on exactly, precisely for 15 minutes. The first dance which was by Ruth Emerson started on the dot of 8:30. As the movie was just about to go off, the six people or so involved came out, the movie sort of dissolved into the dance.' Dunn: Yes this was really incredible, the beginning of the first (Judson)concert. It doesn't sound like much now but it was extraordinary, my hair stands on end to think how that worked. Nobody ever did anything like that." from Don McDonagh, The Rise & Fall & Rise of Modern Dance. Many thanks to Levi Gonzalez and Sarah Holcman. Also to the secret dancers who walked thru the split screen. Going through / organizing Elaine's ephemera for the Archive, we came across this superbly designed The Illuminated Workingman poster we had to share with everybody. It says on the poster the illustration was done by D.Herring but we can't locate him/her. 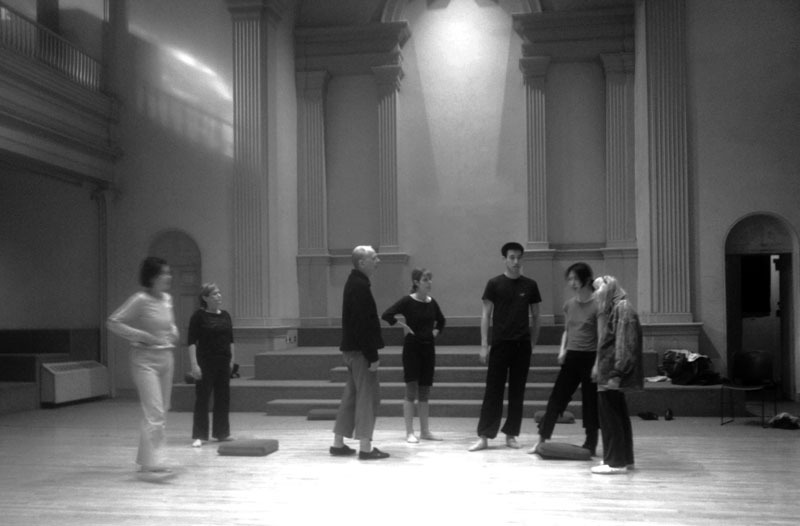 Location: Movement Research at Eden's Expressway, 537 Broadway, 4th floor. New York, NY. Come study with Kinetic Awareness originator and one of the original members of Judson Dance Theater Elaine Summers, with her co-teachers Ann Law and Nina D'Abbracci. The classes include experiential anatomy, the ball work, listening to the language of the body, injury prevention, centering and balancing, keeping your body healthy through understanding the natural movement of all our systems. Work scholarship is available to certification candidates. The 100th issue of PAJ: A JOURNAL OF PERFORMANCE ART has just came out! The editor Bonnie Marranca did a really splendid job. Thank you so much Bonnie. For this special issue, they brought together nearly 80 contributors to the theme of this issue, "PERFORMANCE NEW YORK". Elaine has her contribution "WHAT IS INTERMEDIA, WHAT IS A RAINBOW" along with many of her friends. Bonnie's ability to comprehend the importance of the individual artist to the entire scene where you live is really astounding. Please go to PAJ's website and order a copy! It is really a must read for anyone who is interested in New York avant-garde scene from the 60s to the present. With joyous thanks to all of the friends, swiftly circulating blood that keeps New York City scintillating. To encourage and support our imaginations to give us a world on this little island with all its beautiful estuaries. This video was shot in 1971 at the first Experimental Intermedia Foundation loft at 25 East 4th street. It shows Elaine and Pearl Bowser talking about editing Trisha Brown's Walking on the Wall performance from Whitney Museum. This is an excerpt from 20 minute documentary about the EIF. Bill Haley Freeman lived on the first floor. The elevator there was an old cable elevator, so to use it everybody in the building had to corporate. Bill was a young video maker, and he did the whole tape about the foundation. It was right after we moved in. Carman Moore was one the first artists, and Constance De Jong was our first administrator. It is Carman's music you hear in the background. Wednesday, November 2, 2011, 4:30 p.m.
We're pleased to announce a special program of three films, Judson Fragments (1970), Another Pilgrim (1968), and Windows in the Kitchen (1977), at the Museum of Modern Art on Wednesday November 2nd as part of To Save and Project: The Ninth MoMA International Festival of Film Preservation; the annual festival of preserved and restored films from archives, studios, and distributors around the world, from October 14 through November 19, 2011. This screening is one of two programs organized by New York Women in Film and Television (NYWIFT) of films preserved through its Women's Film Preservation Fund (WFPF). The fund was co- founded in 1995 by The Museum of Modern Art and New York Women in Film and Television in order to preserve the cultural legacy of women in the film industry. Both programs are organized by Anne Morra, Associate Curator, Department of Film, The Museum of Modern Art, in collaboration with Drake Stutesman, co-chair, The Women's Film Preservation Fund. For more information on the screening, please visit the MoMA website. J. Hoberman writes about to Save and Project in a recent Village Voice article. IMAGE: Stills from Judson Fragments - Steve Paxton and Deborah Hay performing The Deposits at Kutcher's Country Club. We had a great meeting with Tanisha Jones (director of the Moving Image Archive at Jerome Robbins Dance Division, The New York Public Library for the Performing Arts) yesterday. Her help and support for Elaine Summers archives at the NYPL is tremendous, and Tanisha is in charge of preserving the integrity of many historical works that reside there. She took us on a tour inside their vault, and you can feel ghost of passions that still emanate from what they have there. It was a very powerful experience. On a way out of the building, we noticed an exhibition - and what a coincidence, it was Eiko & Koma exhibit RESIDUE. Eiko & Koma and Elaine worked together back in the days and Elaine respect their work very much. The exhibit was so powerful - we highly recommend it. It closes on October 30th, at the New York Public Library for the Performing Arts, Vincent Astor Gallery - 111 Amsterdam avenue, NY NY 10023. The gallery is open Monday - Saturday, please check their website for more detail. What a wonderful surprise Ann Law came for a visit and brought wonderful presents for all of us. She surprised us having designed and made arrangement to make our own Kinetic Awareness exercise balls with KA logo printed. We immediately got the camera and Ann showed us how she likes to use the ball and we made a video, I am supposed to put a voice over on top but haven't gotten around to it yet. I was so excited with this that I couldn't wait to share it with you. Please contact Ann Law at annlawdancing(at)gmail.com for purchase inquiry. Finally a short video documentation of the performance! Courtesy of Pedro from Serralves. The whole performance lasts little more than an hour, maybe elaine will do a screening somewhere. RAINBOW MANIFESTO (April 15th, 1966) by a Rainbow Man/Fluxus artist Ay-O. Someone please perform this event score and send pictures to us. Click here for pictures from his exhibition/performance at Emily Harvey Foundation Venice. The program is made possible with public funds from the New York State Council on the Arts. Oh we have so much to tell you, the trip to Fundação de Serralves / Museu de Arte Contemporânea Arte in Porto, Portugal was wonderful. We did a performance SUN MOON STARS with Kiori and Thomas (thru ustream from Rotterdam) as dancers, Pauline Oliveros (accordion), Ione (spoken word) and Jason Hwang (violin) doing the music, and great sky videos by Aaron Sherwood, Shona Masarin (images courtesy of NASA), Geoffrey Hendricks, Adolfo (Gatto) Estrada, and Elaine Summers. SUN MOON STARS timelapse by Taketo. Enjoy! We just got the poster for SUN MOON & STARS from Serralves. The woodcut print with the rainbow is by Carol Summers, Rainbow Falls at Night (1974). If you want to see more of Carol's work, check out his skytime page here, or his gallery here. Elaine's performance and workshop info is right below. Saturday, April 9, 2011. 7 PM. Sun Moon & Stars is a part of SkyDance SkyTime SkyWeb. Elaine will be doing an Intermedia workshop on Sunday, April 10 from 2:30 PM to 7 PM at the Fundação de Serralves / Museu de Arte Contemporânea. Come swirls and whirls if you are in the area! Elaine's film from 1973, Two Girls Downtown Iowa is part of an excellent group show Down Low Up High. Performing the Vernacular at Argos Center for Art & Media in Brussels. The show features Trisha Brown, Joan Jonas, James Nares, Calico Mingling+Babette Mangolte as well as Elaine. Click Here for more detail about the show. These are pictures from Buttons and Button Holes, Elaine's Videodance from 1978. It was shot in kitchen in the 5th floor loft of 537 Broadway which was the Experimental Intermedia Foundation studio. The film was produced by EIF. The video is divided into 4 segments based on cultures: Italian, Portuguese, American and Jewish. They read a humorous script/poem Elaine wrote about female domesticity but in their own languages. They all had to bring their own ingredients and do it on one take. In those pictures you see Sao Nunes doing a Portuguese section. She was the only one who successfully threw a cup in the air and smashed it as it landed on the floor as you see in the photos on the left. All those splendid photos are taken by Lona Foote. As we promised, we uploadedanother Elaine and dancers in a beautiful New York City garden on youtube. You can read the scanned article about the film from the last entry. As you see in the film create below, there are few people we can't identify - CAN YOU TELL US WHO THEY ARE? The dancers enter the garden and begin dancing. They mingle, improvising from personal vocabularies. Uniformed city policemen appears and urges them to be on their ways. They protest as they continue to dance, until they moved on to the street and continued dancing. Dancers: Nanette Siebert, Alexandra Ogsbury, Rosemary Butcher, David Myles, Marilyn Wood, Elaine Summers, and a mystery gardener with a hose - who is he? Music: Jon Gibson, Mystery Flute player - help us identify him! Camera and Edit: Mystery guys from NYU Film. Do you know them?! This, we found in Elaine's archive. It talks about her Ford Foundation film very well. Incidentally We just digitized the film as well. We'll post the video soon. Here are some pictures from the SKYTIME/SKYDANCE/SKYWEB - IMPROVIZATION with SUN+MOON+STARS on November 5, 2010 at Emily Harvey Foundation. It was a very fun evening. Thanks Kiori+Thomas+Pauline for the spirited improvization, and Ione for organizing this event. Lisa was awesome in setting up and projecting video feed from Holland! We'll post the video documentation soon. IONE'S 15TH ANNUAL DREAM FESTIVAL. The festival runs from Oct. 1 to Nov. 30 and Elaine is presenting her SKYDANCE/SKYTIME/SKYWEB - IMPROVIZATION FOR SUN+MOON+STARS which features Kiori Kawai solo dancing with multiple projections of evening sky and stars with music by Pauline Oliveros. In continuation of the developing evolution of SKYDANCE/SKYTIME/SKYWEB, and as a transection of a multiplicity of times and places, Thomas Körtvélyessy will be joining this stage of the ongoing performance via satellite from Rotterdam Holland with the help of Adolfo Estrada, Stichting Stadspodium Rotterdam, Heidegger Studio, Demetri Esdelacropolis, Yoland de Pater / zwart konijn, and Roel Koppelaan / Plankgas. This performance was made possible in part by a generous contribution from Judson Memorial Church. Elaine Summers Dance and Film Would Like to Thank: Russell Connor, Paula Court, June Ekman, Sandra Lea Gibson, Lana Wilson, Leah Gitter, Ed Brand David Gitten, Thomas Houser, Tanisha Jones of The New York Public Library, Thomas Körtvélyessy, Andrew Lampert, Jonas Mekas, Pedro Lujan, Don & Leslie McDonagh, Alison Knowles, Judy Hussie Taylor, Hans Breder, Lily Cohen, Dan Streible of The NYU Orphan Film Symposium, Pauline Oliveros, Ione, Davidson Gigliotti, Sam Friedman, Douglas Burack, Christian Xatrec, and all the dancers in all the realizations of SkyTime/SkyDance/SkyWeb and The Danspace Project. and thank you also to any of those we forgot to mention. Fantastic Gardens, Judson Dance Concert, 1964. Sally Stackhouse and Freddy Herko. Intermedia performance. Program for Fantastic Gardens, Judson Dance Theater, 1964. Design: Carol Summers. Elaine will be doing Dance for Carola. Dance for Carola, a solo without music that was structured as "one thing" opened Concert#6 at Judson Memorial Church back in 1963. Friday Oct. 29, Merian Soto, and Oct. 30, Meg Chang will be dancing. TICKETS $20 (students/seniors $10) with work by Toby ARMOUR, Arthur AVILES, Remy CHARLIP, Malcolm GOLDSTEIN, Aileen PASSLOFF, Yvonne RAINER, Carolee SCHNEEMANN, EmmaGrace SKOVE-EPES, and Elaine SUMMERS. For more ticket information call (917) 727-0431. Or visit Judson Memorial Church website. We will be hosting NOT-FOR-PROFIT: 501C3 WORKSHOP & DISCUSSION. This is not to be missed for anyone who is interested in 501C3 organization. 1. Should you or shouldn't you; 2. What would it give you; 3. How to structure; 4. Q&A session. Please R.S.V.P. Email: elainesummersdance@gmail.com with subject '501C3 WORKSHOP'. Thanks to NYSCA, NEA, SUNY Buffalo, Dr. Gerry O'Grady and the city of Buffalo. NY. We will be posting the amazing music that enthralled and captivated us at Elaine's Danspace/St. Marks Church event: Jon Gibson's haunting flute solo for Windows in the Kitchen, Pauline Oliveros and her singers' Tuning Meditation made Crow's Nest a truly immersive experience; and Carman Moore and his Skymusic Ensemble provided the drama and flair to the new piece Improvization with Sun+Moon+Stars. Today, we post an excerpt from Tuning Meditation by Pauline Oliveros and her singers. It was an emotionally evocative experience to hear approximately 40 singers communicate through pitch and tones. Listen with your minds ear for a tone. Special thanks to Pauline Oliveros and all the singers for this music. And Raphaele Shirley for the recording. Improvization with Sun, Moon, & Stars - SkyDance/SkyTime/SkyWeb was a big success. We will be posting videos and photos here soon - but in the meantime, here are some reviews and articles. Thank you everybody at Danspace - Carol Mullins, Leo Janks, Judy Hussie-Taylor, Abby Harris Holmes, Abigail Ramsay, and the curator Juliette Mapp. A choreographic sketch by Elaine Summers for the performance of SkyDance/SkyTime at the Solomon R. Gugghenheim Museum in 1984. Please visit http://www.skytime.org/skytime_history.html for a history of SkyDance/Skytime. Imagine the excitement of creating a dance with Matt's exquisite kinetic imagination and the excitement of capturing her dance on film. I looked for her and I couldn't find her because she moved on to new life. We received a very peculiar letter the other day. It was addressed to Film+Cinema Inc., and there was no return address. We know it was mailed in Oklahoma City because of post office stamp. I owe Andy Warhol and Joe Dalesandro $5.00 to pay for the viewing of their film. I don't know the name of the film. But I saw it on a campus film festival. Enclosed is $5.00 dollars. We have no idea who sent us this letter - but we really would like to find out. It's starting to feel like a summertime and I don't care too much about NYC Summer. Too hot and too humid. When I can't get to sleep, I try to think about snow and running around in a field of snow. There should be a film about people running around in a snow field...wait, there is? Naturally - here goes! A dancefilm by Elaine, IOWA BLIZZARD (excerpt), edited by Bill Rowley. Thanks to NYSCA, NEA, Bill Rowley, IOWA University - Iowa City,IOWA and Prof. Hans Breder and the Center for the New Performing Arts. Ellen Saltonstall is a master senior teacher of Kinetic Awareness. She has just co-written an all-encompassing book about Yoga for Arthritis. It is a comprehensive clear and direct knowledge of the connection of Yoga excercises that relieve pain and develop flexibility for specific problems of arthritis. You can buy it here. Elaine's inspiration and a dear friend Anna Halprin's Planetary Dance is this Saturday, June 20th! It's a participatory ritual on the top of Mt. Tamalpais. Click HERE for more detail. Scott Hull, who is an excellent photographer, shot and edited this video of workingmen outside our building. Our Intermedia media screening "Making Rainbows" at the Anthology Film Archives was a success! Thanks to everyone who came out. Scott Hull took some beautiful documentations, we'll be posting them soon. In the mean time, there are few events by our friends - please click on the photos below to see the detail. Thanks! We are getting ready for our Intermedia media screening "Making Rainbows" at the Anthology Film Archives on March 28, 2009 from 7 PM. Click here for more info. We would like to thank the Experimental Television Center's Presentation Funds program; New York Women in Film & Television; Dan Streible, the NYU Cinema Studies Department and Moving Image Archiving Program; Phill Niblock, EIF; Davidson Gigliotti, the Emily Harvey Foundation; Joshua Selman, the Artist Organized Art; and Andrew Lampert, the Anthology Film Archives. The Experimental Television Center's Presentation Funds program is supported by the New York State Council on the Arts. The day before the historical presidential election on Nov 3rd, 2008, Elaine enlisted several of her friends to mount an Intermedia guerilla public event. With a slide projector and several dancers we hit the street without any concrete plan of action. We were able to project images from Bari's Cafe (thanks guys!) on a north west corner of Broadway and Spring street, while the dancers danced in white costumes and a couple of white bed sheets in front of the cafe. Elaine was extremely happy with the result and hopes to develop the piece into a new piece called "Galumphing". Dancers: Kiori Kawai, Jessica Higgins, Joanna R Steinberg, Joshua Selman and Mark Lanham. Scott and Mark trying few things before going downstairs. Elaine w/ dancers: Jessica Higgins, Kiori Kawai and Joshua Selman of AOA. Here goes the most recent performance of Crows Nest/ Solitary Geography in 2005. Crows Nest was premiered at the Guggemheim Museum in 1981 for the Intermedia Festival by Experimental Intermedia Foundation which Elaine founded in 1968. This recreation was performed at Boston Center for the Arts Cyclorama and organized by Alissa Cardone and Alla Kovgan, members of an intermedia performance collaborative Kinodance Company. Performers include Alissa Cardone, Ingrid Schatz, DeAnna Pellecchia, Debra Bluth, Olivier Besson and Laura Quattrocchi. We edited a short video of Illuminated Workingman for Elaine's interview on the Performance Art Journal. IWM was performed at Niagara Square, Baffalo in 1975. Thirty minutes of dancefilm was projected across a 120 ft-wide screen suspended on the columns of City Hall. The film projected onto the screen captures the faces, feet and actions of Buffalo workingmen, from a man guiding a huge airliner into position at Greater Buffalo International Airport to a Buffalo Sabres hockey player gliding across Memorial Auditorium's ice. Elaine choreographed and directed the intermedia film footage, Tony Bannon filmed this beautiful documentary footage, with Caman Moore doing the music. A new issue of Performance Art Journal (PAJ 90) just came out. Please pick up a copy and read "Gardens of Light and Movement", a 15 page interview with Elaine by a writer/artist Kristine Marx. We would like to thank Bonnie Marranca, a long time editor of the magazine, Kristine Marx, and Paula Court - whose pictures illustrate the article. You can pick up a copy of the journal at McNally Jackson if you are in Soho area in NYC like us, or order online from MIT Press. Dan Streible (of Orphan Films and NYU) have been a big help to us recently. Dan and his former student (also our most recent staff) Gabriella Hiatt have found Elainie's early film Another Pilgrim (1969-BW-41min) and we are discussing some exciting future plans. Click HERE to visit Dan's website about his visit to us. Original 16 mm films of JUDSON FRAGMENTS (1964) B/W - 15 min. and Windows in the Kitchen (1977) Color - 11 min. has been restored and safely delivered to Elaine's archive at the The Jerome Robbins Dance Division of The New York Public Library. You can see the whole list of what they have HERE. JUDSON FRAGMENTS (1964) B/W - 15 min. 21 years ago Elaine Summers directed and choreographed an Intermedia opus for the Lincoln Center -Out-of-Doors Festival entitled Flowing Rock/ Still Waters. Now in 2007, Elaine has been invited to choreograph a new Intermedia work where the dancers are interacting with video projections of the dancers filmed during the performance of Flowing Rock/Still Waters. Numbers of Elaine's friends will be participating: Pauline Oliveros, Alison Knowles, Thomas Kortvelyessy and Joshua Bisset to name a few. The exhibition is a work in progress "constructing the archives of Elaine Summers". Come join us to the archiving of Elaine's choreography, Intermedia works, Kinetic Awareness, DanceFilms and much more. DanceFilms and film documentaries will be screened by request. Special Thanks to Emily Harvey Foundation, Friends of the New Cinema: Jonas Mekas, NYSCA, NEA, The Jerome Robbins Dance Division of The New York Public Library, Dr. Gerry O'Grady, City of Buffalo, Jenneth Webster, The Lincoln Center Out-of-Doors Festival, The Museum of Modern Art, The Guggenheim Museum, Otto Piene, Elizabeth Goldring, Center for Advanced Visual Studies - MIT, Jacob's Pillow, Brooklyn Museum and many more . as a part of 2007 The Dance on Camera Festival. Exploring ways of sketching for Intermedia work (film/dance/installation). A chance to see yourself dance in video projections. A chance to choreograph video images. Choreographic notation with video camera. If you wish please bring your own video camera. "My favorite part of the class was the film. It made everyone's movement look so interesting, and the contrast between the light and the shadows of the body was really cool. It really gave me some interesting ideas for choreographing." Friends of the New Cinema: Jonas Mekas and NYSCA. We found a 3/4" videotape of the rehearsal for SKYDANCE by Elaine Summers with air sculptures by Otto Piene for the 2nd Intermedia Art Festival at IOWA University, Iowa City, IOWA. 1980. Thanks to NYSCA, NEA, IOWA University - Iowa City, IOWA and Prof. Hans Breder. Thanks also goes to the Center for Advanced Visual Studies at M.I.T. and the Experimental Intermedia Foundation.